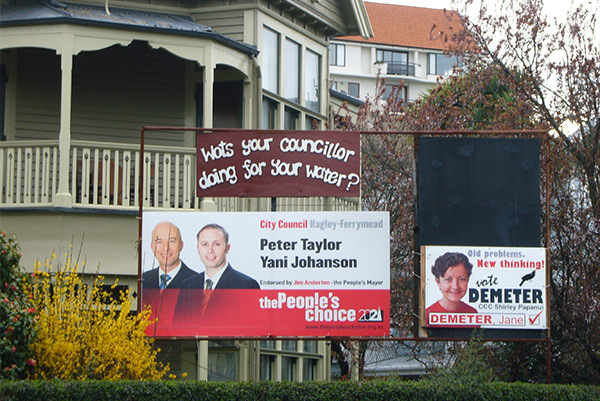 Jean Drage’s new report is about how the right to ‘have a say’ in local government in New Zealand has slowly eroded in recent years. The principle of subsidiarity holds that decisions should be made at the level closest to those affected by them, yet the ability of local communities to have a say in their affairs has been diminished on a range of fronts: a drop in the number of elected councillors per capita; a move to more managerial and less democratic decision-making; the growth of Council-Controlled Organisations; the streamlining of planning and environmental management processes that lessens the input of elected officials and community voices; and central government interference in local government affairs via the Local Government Commission. The outcome of much of this change has been a steady decline in voter interest in local elections and a growing disconnect between councils and their communities. This report argues for a strengthening of local voices in local government and identifies what may help and hinder this. It buildson Mike Reid’s February 2018 report Saving Local Democracy.